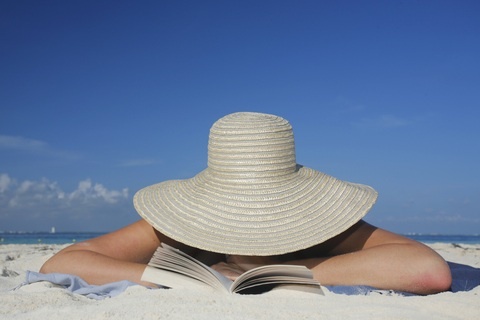 This entry was posted in Favorite Books, Logomania, Reading, The Beach, Vacation by K. E. Blaski. Bookmark the permalink. @SydneyJ. there is a lot to be said for not having to carry around a bag of books. @CutItby20 you’re right that some folks feel strongly either one way or the other. I think there will always be a place for both. I gave up my ereader once I found out Barnes and Noble was tracking when I read, what I read, when Is topped and when and if I started reading again and then sending that information to publishers. Just don;t think it’s anyone’s business. Maybe it’s a matter of practical versus emotional. Practical people will go with the e-reader because it’s infinitely more portable, those with emotional ties to paper will take their paper. Then there’s the group of us that go with whatever’s available at the time. When I go to the beach, it’s going to be the Kindle that goes with me. That way when I finish one book I can move on to the next one and the next.